A computer engineer from Birmingham has been jailed for nine years for an attack in which he stamped on the head of his partner's four-year-old son. Vishar Jain also repeatedly punched and kicked the boy in front of his mother and threw him on to a wooden floor, Birmingham Crown Court heard. 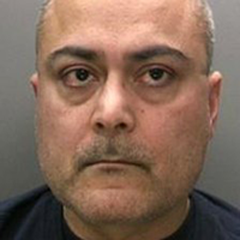 Jain, 44, of Parker Street, Edgbaston, admitted wounding with intent over the attack in March. The boy had a fractured skull and broken collarbone. He also suffered cuts to his mouth and bruising during the attack in Weoley Castle. Speaking after Tuesday's court hearing, a West Midlands Police spokesman said the reason for the assault was not known. The child's mother was also beaten when she tried to intervene and suffered facial bruising and eye injuries. Det Con Hayley Bubb said: "We will never know why Jain decided to viciously beat this little boy. "This was an unprovoked and sustained attack on a defenceless child, which he has never explained. "Although he has recovered well physically from his injuries, emotionally it will take a long time for him to get over the attack."